The award-winning Sensi™ Touch Wi-Fi Thermostat makes comfort control easier with upgraded features that are more adaptive to your customers’ lifestyle. Lower install time. Higher bottom line. The new Sensi Touch Wi-Fi Thermostat comes equipped with built-in install tools to keep techs moving— and your business efficient. Hear what the pros have to say about installing Sensi. Sensi Thermostats now work with the Google Assistant. Sensi™ Thermostats let you connect to your home comfort-Anytime. Anywhere. And now we’re making it even easier through integration with Google Assistant. Watch how the family behind Williams Heating & Cooling partners with Sensi to keep their community connected. Meet the new Sensi Touch Wi-Fi Thermostat. Get up close and personal with the enhanced features, attractive interface and easy install of the Sensi Touch Wi-Fi Thermostat. After all, it was designed with the pros in mind. 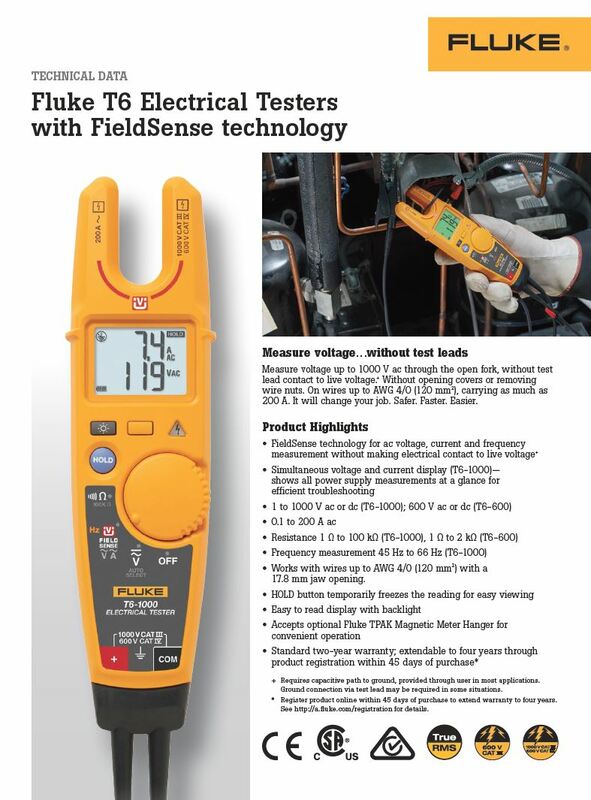 Fluke has now developed FieldSense technology that takes the open-fork, current-measuring functionality of its existing T5 Electrical Tester and adds ac voltage measurements. So now, you can use Fluke tools to take simultaneous voltage and current measurements — not just detection — without test leads. Amprobe has done it, a more affordable infrared camera! Introducing the AMPROBE IRC-110, an affordable Point and Shoot Thermal Imaging Camera for the Professional. 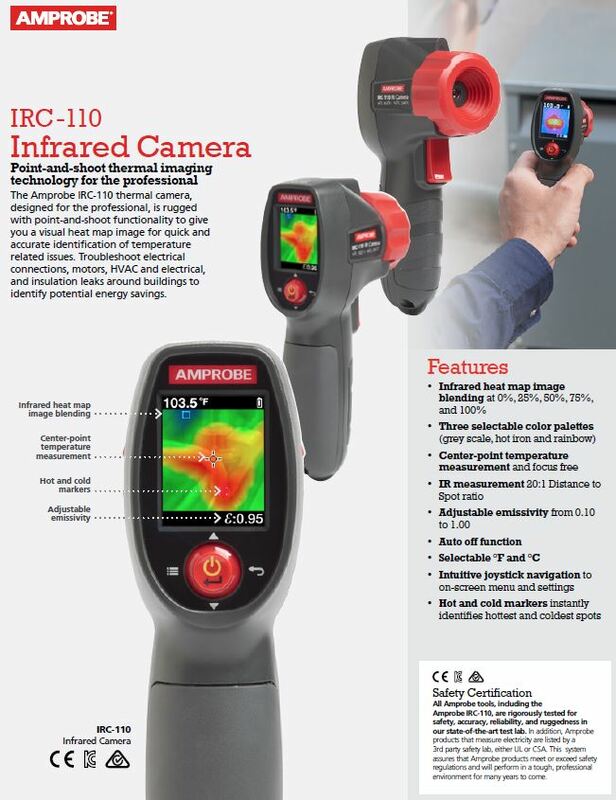 The Amprobe IRC-110 thermal camera, designed for the professional, is rugged with point-and-shoot functionality to give yoiu a visual heat map image for quick and accurate identification of temperature related issues. Troubleshoot electrical connections, motors, HVAC and electrical, insulation leaks around buildings to identify potential energy savings. 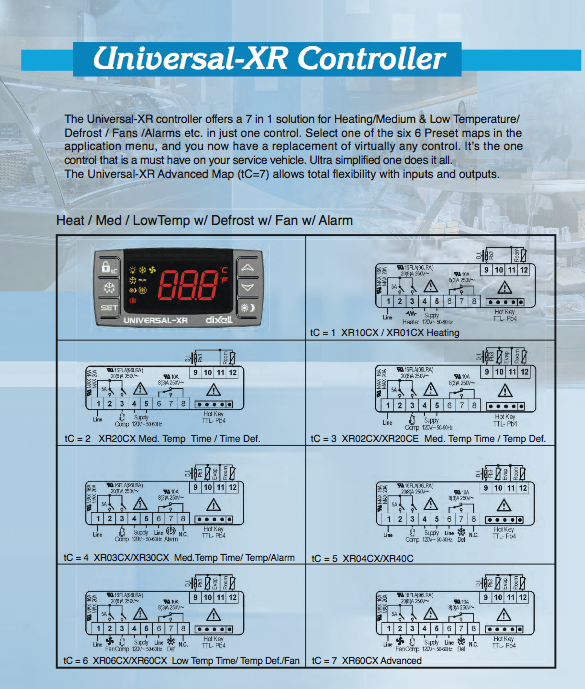 The Universal-XR controller offers a 7 in 1 solution for Heat / Medium / Low Temperature w/ Defrost w/ Fan w/ Alarm in just one control. Select one of the six preset maps in the application menu, and you now have a replacement of virtually any control. It’s the one-does-it-all control that is a must-have on your service vehicle. The Universal-XR Advanced Map (tC-7) allows total flexibility with inputs and outputs. Introducing Connected Comfort for All! Thermostat with remote access from smartphone, tablet, or PC. No “C wire” required for most HVAC applications—works with existing wiring and 2 AA batteries. Universal—4 Heat / 2 Cool—With industry leading control to +/- 1 degree. Use the Sensi App to connect thermostat to home Wi-Fi router—no additional accessories required. Unique contractor branding in the Sensi App—be sure you get the next service call. Requires iOS or Android to connect. The Sensi logo is a Trademark of Emerson Electric Co.